And some said the apocalypse was nowhere to be found. The average number of killer tornadoes is 20 per year. So far this year, there have been 50. The 226 tornadoes on April 27 that killed 340, primarily in Alabama and Mississippi, was a record for the most tornadoes in one day. 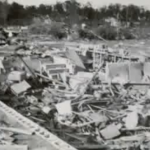 In 1953, tornadoes killed 519, including 116 in Flint, MI, 114 in Waco, Texas, 90 in Worcester, Mass. The carnage from those twisters led to the federal government creating a ground based radar system. Until then, predicting tornadoes was slightly more accurate than predicting the Rapture. 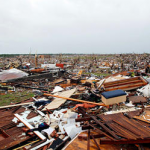 The Christian Science Monitor asks if tornado warning systems should be considered a national security matter, since people in Joplin had only a twenty minute warning. One tornado that changed the course of history, our history, occurred during the War of 1812. The British were having a good ole time rampaging and burning Washington, when Mother Nature struck back, forcing the British to retreat..
“After the battle, the British Army marched quickly into Washington while American soldiers, United States government officials, and residents fled the city. There were no officials left in Washington from whom the British could seek terms of surrender. The British admiral ate dinner in the White House, then gave the order to set fire to Washington. Within hours, the White House, the Capitol, and many other public buildings and residences were burning. On the morning of August 25, Washington was still burning. Throughout the morning and early afternoon, the British soldiers continued to set fires and destroy ammunition supplies and defenses around the city. As the soldiers spread fire and destruction throughout the city, the early afternoon sky began to darken and lightning and thunder signaled the approach of a thunderstorm. As the storm neared the city, the winds began to increase dramatically and then built into a “frightening roar.” A severe thunderstorm was bearing down on Washington, and with it was a tornado. The tornado tore through the center of Washington and directly into the British occupation. Buildings were lifted off of their foundations and dashed to bits. Other buildings were blown down or lost their roofs. Feather beds were sucked out of homes and scattered about. Trees were uprooted, fences were blown down, and the heavy chain bridge across the Potomac River was buckled and rendered useless. A few British cannons were picked up by the winds and thrown through the air. The collapsing buildings and flying debris killed several British soldiers. Many of the soldiers did not have time to take cover from the winds and they laid face down in the streets. One account describes how a British officer on horseback did not dismount and the winds slammed both horse and rider violently to the ground. In a “twist” of fate, excuse the play on words, we can credit the tornado for the U.S. national anthem, the Star-Spangled Banner, written by Francis Scott Key. If the tornado didn’t hit Washington, forcing the British to evacuate, Francis Scott Key would not have had the opportunity to write the Star-Spangled Banner, that was also inspired by an 18th century British drinking song. Here’s a remarkable account of the killer wind that hit Flint, Michigan in 1953.